Patti Lozano sings a catchy song about classroom objects in the classroom. In the song, Patti Lozano wonders why her backpack is so heavy. Is it the calculator? Is it the pen? Or could it be the book? The lyrics are included for you to sing along! 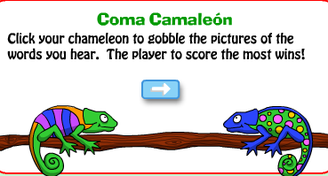 Click on the image to go to an interactive website to practice vocabulary. La Vaca Lola is a song describing a cow named Lola. She has a head and tail. Be sure to ask your child to sing the song and perform the dance! To the left is a copy of the flashcards that are used in class. Please feel free to print them out and use them to practice vocabulary words. Below is a list of the words with the definitions. 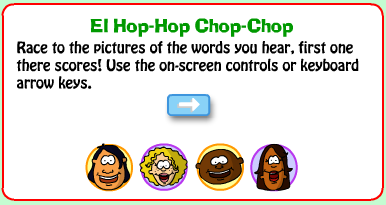 Students love practicing the parts of the face on this fun and silly site. This video also includes the months of the year in Spanish. Click on the picture to play an interactive game to practice calendar vocabulary. 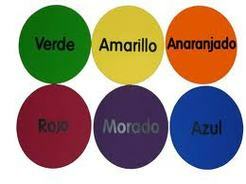 On this site, you can learn your colors through numerous games - Memory, multiple choice, and spelling activities. Here is a great site that helps students to learn their numbers by breaking them into groups of tens. Click on various videos to learn your numbers! Here is a song that teaches the Spanish alphabet. Enjoy!